Executing a large-scale program is difficult. This course, Program Management: Executing Your Program Successfully, will teach you how to start your program, handle unexpected developments, and ensure your program's benefits continue after delivery. Executing a large-scale program composed of many smaller component projects is a challenging proposition. In Program Management: Executing Your Program Successfully, you will learn foundational knowledge to ensure that your entire program runs successfully, from start to finish. First, you will learn how to start each of your program's component projects on the right foot as well as how to work more effectively with each member of your program team. 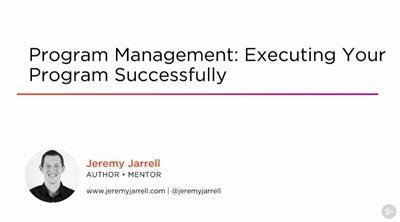 Next, you will cover how to manage the execution of your entire program once it's in-flight as well as how to handle any unexpected developments which may occur along the way. Finally, you will discover how to review the status of each of your program's component projects in a way that helps your stakeholders understand how each component project is contributing to your program's overall goals as well as how to ensure the benefits delivered by your program's component projects will continue long after closure. When you are finished with this course, you will have the skills and knowledge of program management needed to successfully execute and deliver a large-scale program that delights your stakeholders.